Casting Call Club : GHOST COW!!!!! Voices needed for original cartoon!!!!!! Casting Call for GHOST COW!!!!! Voices needed for original cartoon!!!!!! GHOST COW!!!!! Voices needed for original cartoon!!!!!! About GHOST COW!!!!! Voices needed for original cartoon!!!!!! This cartoon project will be a Halloween based special inspired by many classical Disney shorts and Halloween films. Summary: The story focuses on Annie Moo, a country southern dairy cow that visits a cabin rumored to be haunted, and swipes a golden cowbell in the barn. This later brings on the wrath of a ghost cow named Agatha, determined to haunt Annie until she gives back what she stole. I am looking for voice actors that suit each of the characters’ personalities and attitudes perfectly; example such as the characters Tilly and Tom needing to sound like youngsters instead of adults. 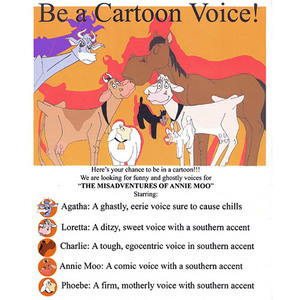 All the characters’ voices need to have a southern drawl since they live in the American South. Agatha the Ghost Cow: An eerie, evil, phantom bovine whose past and true origins remain unknown. Her one and only goal is to stalk and haunt anyone who steals the golden cowbell that used to belong to her before she passed on. She is like a vengeful poltergeist with the power to transform dreams into nightmares and make them look real enough to tempt, seduce, or taunt her victims before luring them into a terrible fate. Voice type: Eerily ghastly, manly, aggressive, and terrible tempered. What shall it be, the bell…or your soul? Time for a little stroll around town. Bio: A carefree, childish, naïve, stubborn, ambitious, and loopy southern dairy cow who has a knack for getting herself and others into all sorts of trouble when her curiosity and temptations get the best of her once caught by Mrs. Baker. Whenever she is told NO by anybody; that only encourages Annie to do it anyways. Although she can’t carry a single tune, she can be a good dancer when she wants to be. At most times, she can be lazy and sleep all day by her favorite spot under a tree, having little interest in chores. But whenever she is bored, she’ll break the rules of staying inside and go out on her own for crazy adventures. Ain’t that a fine fact, eh Charlie Horse? I’d rather be in my flower bed than do the workof a blasted mule. This ain’t no time for needless drama. Loretta: An energetic, athletic, ditzy, yet gentle, goodhearted dairy cow who is a year younger than Annie and is intent on staying out of trouble and behaving like a real average, country lady. She is devoted and loyal to Mrs. Baker who has raised her since she was a calf, often reluctant to go along with whatever scheme Annie has come up with that might make their owner angry or sad, and has a tendency to be sharp tongued whenever Annie or anyone else is out of line. Unlike Annie, she is known to carry a great tune when it comes to singing, which makes Annie jealous. However, despite their differences in a lot of things, Loretta is often fascinated by the possibilities for excitement opened up by Annie’s schemes. At times she can be shown as slightly vain and proud during her moments at the county fair, which can lead to a rivalry between her and Annie. Voice type: A high, energetic, yet soft southern drawl in a younger tone. Annie, are you outta your insane mind? I would never turn my back on dear ol’ Mrs.Baker. This sure is the life o’ a typical country gallike me. Tilly and Tom: The mischievous and troublesome lambs that are the son and daughter of Phoebe, and often run rampant creating chaos, and give Annie a hard time with watching over them whenever Phoebe expects her to be responsible instead of just being lazy. Tom is the black lamb that comes up with the most schemes to drive Annie crazy while Tilly goes along with it for fun. Voice type: Both must be childish, young, hyper, and energetic. Play with us or else! Over here, come and get us!